Flowering Scotch-broom (Cytisus scoparius) plants are invasive weeds affecting native plants in Washington State and other parts of the United States. 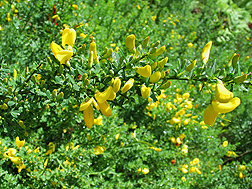 The people who brought Scotch-broom (Cytisus scoparius) from Europe to the United States thought the woody legume and its bright yellow blossoms would be an ideal ornamental for California gardens and could help stabilize fragile hill slopes. But they inadvertently introduced an invader. The vigorous perennial shrub acclimated easily to the new terrain. It now thrives throughout the Pacific Northwest and the eastern United States, displacing native ecosystems and altering soil chemistry via nitrogen fixing wherever it goes. On their native turf, individual Scotch-broom plants produce up to 9,600 seeds annually, but that outputs soars up to 14,000 seeds per plant in nonnative ecosystems—and seeds can stay viable for years. Resource managers at the Joint Base Lewis-McChord (Fort Lewis) military installation near Tacoma, Washington, are trying to restore native prairie ecosystems that once thrived in the region. But they have been thwarted by flourishing thickets of Scotch-broom, which can grow to heights of 6 feet or more. So a team of researchers, including Agricultural Research Service entomologists Ray Carruthers and Angelica Reddy, investigated options for using an integrated weed control strategy to control the exotic survivor. Carruthers is the research leader at the ARS Exotic and Invasive Weeds Research Unit in Albany, California. To date, the plant has been contained at Fort Lewis with some success by using controlled burns, mowing, or releases of a biological control agent, the Scotch-broom seed weevil. The mowing and burning control strategies had been applied to many Fort Lewis sites for at least 20 years. 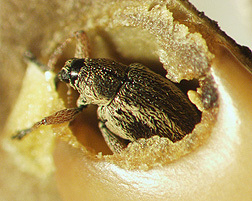 An adult Scotch-broom seed weevil (Exapion fuscirostre), a potential biological control for Scotch-broom, emerging from a Scotch-broom seed. In their study, the scientists evaluated three management strategies: weevil seed predation alone, weevil seed predation combined with mowing, and weevil seed predation combined with burning. They surveyed pods and plants for two seasons to measure seed production, seed predation by weevils, weevil numbers in pods, and seed bank densities. There were no observed statistical differences among the three management strategies in the number of seeds per pod, weevil counts per pod, or proportion of seeds eaten by the weevils per pod or per plant. But combining weevil predation with either burning or mowing significantly reduced the number of pods per plant, mature seeds per plant, and seed bank densities relative to weevil predation alone. The combination strategies also reduced the per-plant production of healthy, mature seeds. More research is needed to validate the best possible strategies for controlling Scotch-broom. However, in light of these findings, the researchers think that using 3-year rotation fires with seed predation could provide more effective long-term management of Scotch-broom at Fort Lewis. Other work there showed that burning did not disrupt native prairie plants, and sometimes Scotch-broom that was mowed came back even more vigorously—an outcome that could result in an endless loop of ineffective eradication efforts. The scientists, who published the results in 2012 in Invasive Plant Science and Management, received an award from the Weed Science Society of America in 2013 for the “Outstanding Paper in Invasive Plant Science and Management.”—By Ann Perry, Agricultural Research Service Information Staff. Raymond Carruthers is in the USDA-ARS Exotic and Invasive Weeds Research Unit, 800 Buchanan St., Albany, CA 94710; (510) 559-6127. "Sweeping Away Scotch-broom Shrubs" was published in the October 2013 issue of Agricultural Research magazine.